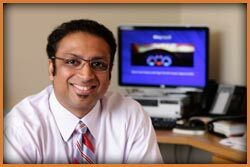 Bley successful, manager Krishna Rajagopal answers without hesitation, "technology." The history of Bley traces back to German-born Otto Bley, who went into business for himself in 1920s Germany. His son Erich Bley learned the machining trade in Germany before the family moved to Chicago suburb Villa Park in 1966. Erich set up what would eventually become Bley, LLC in Elk Grove Village in 1968. The family moved to Elk Grove Village shortly thereafter. Rajagopal points out that modern technology and innovative thinking are used at Bley from the creation of a prototype to pre-production on through completion. "Our goal is to provide a high quality product at a fair price. We have a wonderful reputation as a company who put our heads into the work that no other shop is doing or that our competitors find too difficult," Rajagopal notes. This strategy has paid off. In a time when other machine shops are closing their doors, Bley is expanding. Just a few years ago, the company had 3 large machining centers. That number has now grown to 22. The number of employees has doubled in the last several years. Bley works, on average, with over 1,000 customers worldwide, from Fortune 500 companies to growing businesses. Among others, they service aerospace, heavy transportation, mining, oil and gas, packaging, nuclear, medical and waste water treatment companies. Bley always welcomes customers to visit the headquarters and discuss with engineers the steps needed for company to conceive and machine any necessary parts. Bley is playing a signature role in creating the industry surrounding wind-power energy. The wind turbines you may see when driving in many rural areas require large, complex components to function. The company machines the "planet carrier," or the engine that drives it, as well as the torque arm. Both are created on Bley's horizontal milling machine, also called a boring mill. Like every piece of machinery that Bley controls, computers guide the creation process. Bley's work with wind turbines is more than just profit-driven, it's also socially responsible: Bley is assisting in the interminable global effort of weaning the world from its high usage level of nonrenewable energy. Wind energy currently helps power more than 4 billion households across the world, but only provides about one percent of the United State's energy demands. In 15 years, the expectation is that it will grow to about 20 percent... a number Bley could be instrumental in achieving. Bley is also a member of AWEA: The American Wind Energy Association, lobbyers for increased attention to wind energy in the U.S.
A diverse range of state-of-the-art tools and equipment gives Bley the agility and flexibility required to provide consistent production of high-volume orders, while also cost-efficiently accommodating moderate to low volumes. ?Automated parts loading helps utilize machine time efficiency. A computerized tool preset area helps yield minimum time for machine set-up. Lower part cost and maximum machine time is further realized by back up tooling for high volume orders. 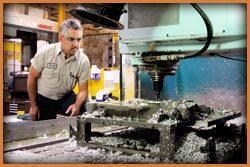 An in house Fabrication Department gives Bley customers a one-stop resource for complete fabrication and machining. Bley has the resources to saw, burn, roll, shear and form steel, stainless and aluminum. This value-added capability compliments this main focus of machining, allowing the company to maintain close control on processing in prep and final machining. Bley can efficiently fulfill either repetitive batch orders or single-part projects. 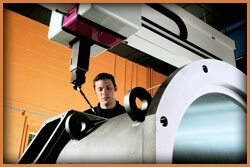 Product capabilities include rolled barrel, burned and cut plates, prep machining, stress relief and final precision machining. With extensive experience in the production of components, sub-assemblies and machines, Bley engineers can provide guidance in selecting the most cost-efficient path to meet client needs. Bley's primary competency involves complex, high-tolerance components, so that the company won't struggle with the most difficult of projects. Its "get-it-right-the-first-time" philosophy ensures that costs are kept down while creating a quality product in a timely fashion. Such a philosophy is essential in machining. If there is a misstep in the precision not caught before production, the consequences can be quite costly. Bley is also dedicated to "reverse engineering" products and components in the event that a client needs to replace obsolete components or has to contend with lost prints and incomplete documentation. The company will create assembly drawings with tolerances and material analysis to meet the requirements of any parts requiring reverse engineering. Once this is complete, Bley will assist the client in the manufacturing of the machine or component. Even after parts are built, Bley will monitor their functionality on its computers. Bley can develop and manufacture both prototype and production machines. The engineering and production staff is ready to work with customer requirements for new machines. With production facilities in both the United States and Europe, Bley can effectively meet international needs. Bley doesn't just build...it also repairs. The company offers a suite of assembly and component repairs on all parts, ranging from those the size of a tin box to a 30,000-pound mass of metal the size of a van. It works with the customer to "reverse engineer" components before developing a standardized repair procedure. What ultimately sets Bley apart from other companies is their uncanny ability to listen to their customers and provide what they need. This begins with the very first contact. "Our customers trust us," Rajagopal confirms. He adds, "We are transparent in our dealings with them. Bley provides a high quality product at a fair price which means that our customers return again and again." One can only imagine the exciting developments that will be forged in manufacturing over the coming decades, but one thing is for sure - Bley, LLC will be right there to help its clients stay head and shoulders above the competition.